Cookie time! I know I haven’t posted a ton of cookie recipes here on Juliet’s Sweets, but that, my friends, is about to change. And all with this recipe. 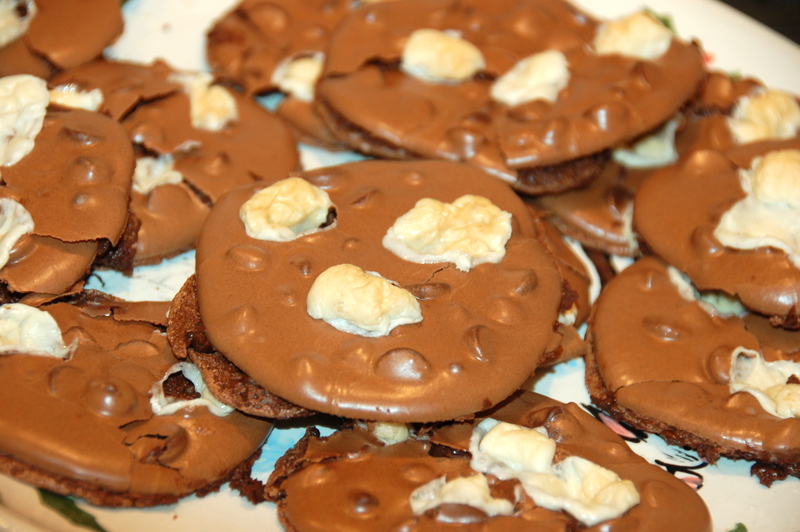 After making these amazing rocky road cookies, I’m inspired to make more! These cookies are unlike any other type of cookie I’ve made before, or seen anywhere! Because they’re flourless, the ingredients combine and form two distinct layers. On top, there’s a crispy, flaky layer of chocolatey goodness, and below that, there’s a fudge brownie-like layer that makes the cookie so gooey and delicious. In the picture above, you can see just what I’m talking about! When I was combining the ingredients, the batter looked very wet, and like the cookies weren’t going to turn out well. But, I baked them anyway, and I’m so glad I did! They ended up turning from an overly wet batter into a unique, delicious cookie. Their consistency is almost like a French macaron shell – a bit of crunch in the outer layer and a chewy, gooey layer below. 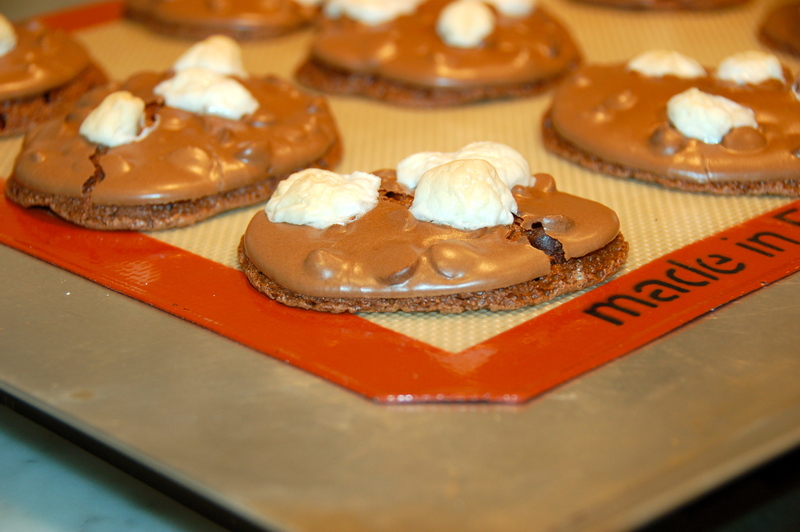 The cookies are so special because of the two layers, but also because of the marshmallows! Sometimes, It’s difficult to incorporate marshmallows into a recipe without having it end up tasting too sweet, or only appealing to little kids. But in this recipe, you just toss a few marshmallows on top of the scoops of batter, and then watch them brown in the oven! Amazing. 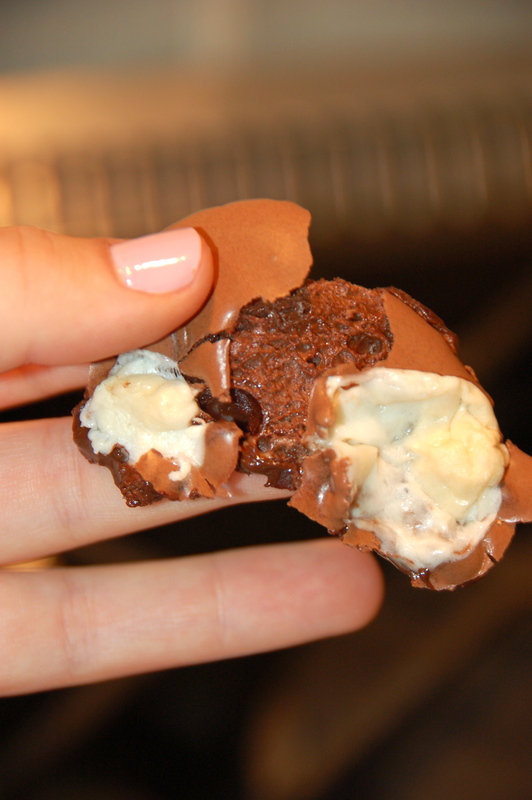 Enjoy the recipe, and try not to eat these all at once! 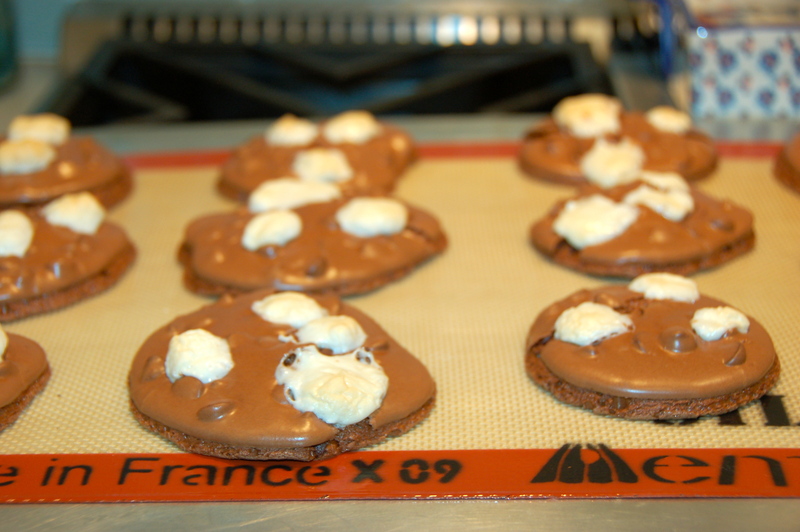 Preheat your oven to 350*F and line one cookie sheet with a Silpat liner or parchment paper. In the bowl of a stand mixer, whisk together the powdered sugar, cocoa powder, and salt until combined. Add in the egg whites and vanilla on medium speed until the ingredients look evenly mixed. Stir in the chocolate chips with a rubber spatula. Using a 2 tablespoon scoop, make 12 mounds of batter on your cookie sheet, and press three marshmallows onto the top of each one. Pop the sheet in your refrigerator or freezer for 5-10 minutes to prevent spreading while they bake. 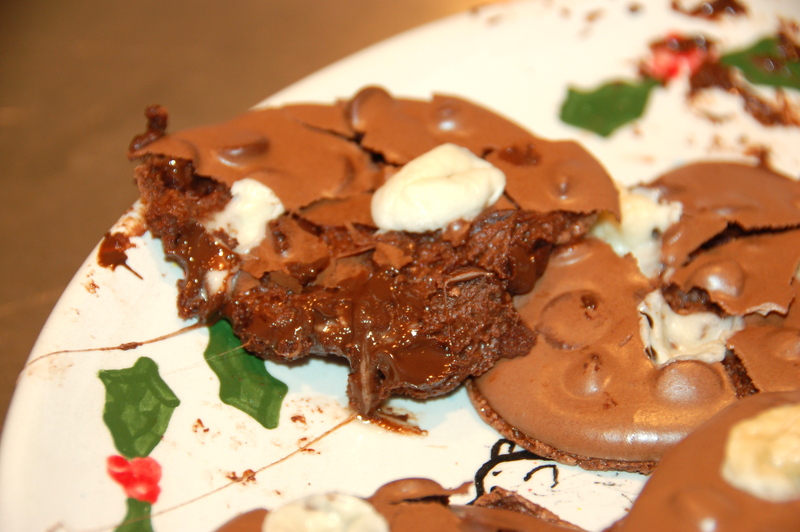 Bake the cookies for 12 minutes, or until the marshmallows are golden brown on top! Make sure you let the cookies cool and set on the pan for at least 20 minutes before moving them. Enjoy! Thank you!! I’m restraining myself from having another right now!